One of the most intimate and serene moments is when you read the Qur’an and realize that, actually, it is reading you; that it is explaining the deepest, most intimate secrets in your heart. It is amazing how this Book reads the human being, reads life and reads the universe. The Qur’an is one of the greatest manifestations of The Creator’s mercy to all of us. In the toughest situations, when one is almost completely shattered and broken, going through the pages of the Qur’an will ease the pain, put things in perspective and put one back on track with a clear vision of the destination ahead. You see, the human being is body, mind and soul. We know how to feed our body (food), we know how to feed our mind (education), but sometimes we neglect to feed our soul. 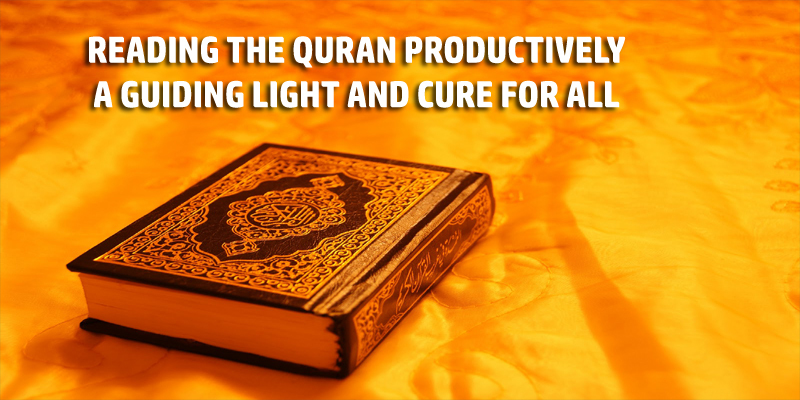 The Qur’an is the nourishment and healing of the soul. In this verse, Allah swore by the setting, or the locations, of the stars that this is a most generous and noble Qur’an. But what do the stars do? The stars guide and enlighten. In one of his lectures, Sheikh Hamza Yusuf shared his insights on this saying, that if you talked to a pilot or someone travelling helplessly in the desert, and ask them what they would do if they got lost, they’ll tell you they follow the stars. One star after the other guiding the person to his destination. Similarly with the Qur’an. While reading the Qur’an, remember that there will be ayat (verses) that are especially and most intimately there for you. They’re there in this Holy Book, to be a guiding light to you. Seek those verses. You may read a whole juz’ (chapter) per week, but there will be one verse (or a few) that will just touch you when you need it the most. Seek those ayat. Make sure you search for them and find them while reading. Those are your stars, your guide. Do not merely set a target to finish a chapter per week, yet it has no effect on you. There would be no purpose to your reading the Qur’an in this manner. Remember that the Qur’an is basically a manifestation of Allah’s mercy and compassion for human beings whom He created. So The Holy Qur’an is what you have from The One you belong to. It explains you. It explains life. It cures, guides, soothes and enlightens you. Do not rush through reading the Qur’an without reflection This is not the ultimate goal or ultimate success. The success is that it fills that time with light and wisdom and beauty, for you and everyone around you. So what is your niyyat (intention)? Set your intention before reading the Qur’an. Is your intention to get extra points in your book of good deeds? Do we approach Allah with greed? Do we only want what He has to offer or do we approach Him with the niyyat of gaining knowledge – knowing that He is The Source of Knowledge (Al ‘Aleem); to get light – knowing the He is The Source of Light (Al Noor); to get hikmah (wisdom) – knowing that He is The All-Wise (Al Hakeem); to get love – knowing that He is the Most Loving (Al Wadud). Seek the nearness of Allah through His Book. Ask Him to guide you, cure you and show you the light. Ask for this to reflect on your character, increase you in humbleness, mercy and desire to serve people knowing that the most beloved to Him are those who are most useful to the Ummah. 3. Remember to ask Allah to teach you. So ask Allah to show you the meaning and the wisdom, to show you the marvels and treasures in it. This begins by making sincere dua to Allah. Perhaps in sujood, when you are closest to Him, in intimate communication. Allah facilitates the task and opens doors. In this day and age, through all the means of communication, researching and gaining knowledge has become facilitated. Great speakers of tafsir (Exegesis), as well as websites and books are all available to us. These are all means (asbab) that you can utilise. Ultimately, though, it is through the help and guidance of Allah alone, that there will be success and meaning through those actions. So, ask Allah. 4. Find good company and aid one another in reciting the Qur’an and learning its different enriching sciences. Form groups of recitation, tafsir and tajweed, help one another. Also, join relevant events in your area. The time you spend seeking knowledge of the Qur’an is an investment. The Qur’an itself means that which is being read/recited often. So you need to be constantly connected with the Qur’an. Allah gave you intellect and gave you ‘ilm (knowledge), and He created this ‘Aalam (universe). In essence, this ‘Aalam is a means to reach Al ‘Aleem! Thus, we have a life time worth of learning, elevating and growing in knowledge and closeness to the Source of Knowledge. 5. Commit yourself to reading Qur’an at a set time everyday. Take pleasure in this reading time; ponder the words, the verses and let it wash over you and grant you the guidance and cure that you seek. Whatever you carry from this Book in your heart is better than the worldly riches we’re collecting that don’t necessarily bring deep satisfaction into our hearts. 6. Make sure to carry something in your heart from the part you are reading in the Qur’an. Find beautiful ayats that affect you, then look up its tafsir, understand it well, memorize it and share it with your friends, family and on social media. It could be only one verse, but it will become part of your heart and life and effect a positive change. 7. Remember the beauty of reading the Qur’an. Remember that houses in which the Qur’an is recited will be filled with light. Just like you remembered Allah, He will remember you and raise your mention in the highest heavens. 8. If you are asking when to read, there is nothing like reading the Qur’an at Fajr (dawn). This is the most beautiful time for Qur’an. You will hear the leaves and birds, every creature, praising and doing tasbeeh of Allah, at Fajr. You are basically joining this symphony, in harmony with nature, in remembrance and praise of Allah -The Creator. Be among those who remember. May Allah fill our houses with His Light. May Allah bring us closer to Him and elevate our status with Him through reciting His Book. May Allah make the Qur’an a cure, mercy and guidance for everyone who reads it.